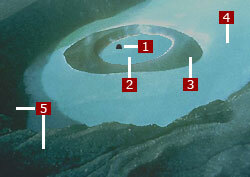 A small volcanic rock island is surrounded by a small lake which sits inside a small volcano crater which is surrounded by a large lake which sits inside a large volcano crater . Taal is a popular day trip from Manila. It's only 50 kilometers (30 miles) away. Taal is also popular as a summer vacation retreat. The climate is cooler than in Manila. A must for adventure travelers is climbing Volcano Island. You take a half-hour ride in a small boat to the island, then hike (30 to 45 minutes) or horseback (20 to 25 minutes) up to the ridge for a breathtaking view of Crater Lake. During summer, the sun beats down relentlessly – and there are no shade trees on the trail to the summit. So plan an early morning start – and wear sun screen and a broad-rimmed hat. Visit the town of Tagaytay located on the ridge of Taal Volcano. It has outstanding panoramic views of Taal Lake and Volcano Island.